As the season progresses a potato changes e.g. an Ilam Hardy early in the season (October) is quite waxy. 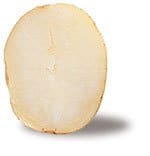 A mid season Ilam Hardy is a good general purpose potato, while towards the end of the season a lot more of the natural sugars have converted to starch, so it tends to be floury. Not all potatoes show such a range of characteristics. Weather, climate and soil have a dramatic effect on the cooking performance of a potato e.g. a Southland grown Nadine may be very waxy while a Pukekohe grown Nadine may be only slightly waxy. Flavour is also influenced. There is a lot of interest in different potato varieties. Many varieties are grown in New Zealand, however, there are about 10 to 12 varieties which are ‘common’ and readily available. In addition there are varieties which have limited and/or localised supplies. There are two main parts of a potato – water and starch. The more starch in the potato the more ‘floury’ it is. The more water, the more waxy the potato is in texture. It is important to remember both are different when cooked. To determine which category a potato falls into, the percentage of dry matter is measured – in other words, the percentage within the potato which is not water. Some potatoes have moderate amounts of starch. These potatoes fall into the general purpose category and will tend to perform most tasks, although perhaps with not as good results as the ones which clearly fall into the floury or waxy categories. For boiling, salads, braises and stews use waxy, smooth textured potatoes. 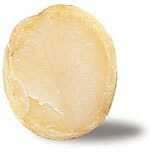 Waxy potatoes have a high water content and are low in starch. They have a dense texture and retain their shape during cooking. They don’t absorb a lot of oil or dressing. Some potatoes can be used for most end uses. 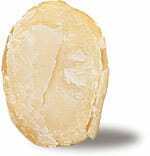 These good all-rounders have a moderate starch content and are not too floury, not too waxy. They are called general purpose potatoes. For mashing, wedges, roasting, chips and baking use floury potatoes. Floury potatoes are low in water content and high in starch. They have a dry and delicate texture, break up easily when cooked and absorb a lot of liquid and flavour. * Depends on growing conditions, weather, and time of year. Use waxy potatoes for boiling as floury potatoes will not hold together when boiled and will not make a good salad. Similarly, if you try and mash a waxy potato your mash will be gluey. For consistent results buy potatoes by End Use** rather than variety. Growers cook test potatoes to assess how they perform when cooked. The variety of the potato is generally marked on the packaging either on a neck tie or by a sticker. The variety within the bag will change depending on what variety the grower assesses to be the best option at that time.